What is church-state separation (aka political secularism)? Only three months later, however, the Holy See unilaterally named itself a permanent observer at the United Nations. This gave it a continuous presence at the UN which was invaluable for lobbying. Thus, even while Vatican II was underway, Paul VI was quietly extending the temporal power of the Church on the world stage. Perhaps Paul VI's most momentous reversal of the direction set by Vatican II was his rejection of effective methods of family planning. In 1963, the same year as John XXIII convened Vatican II, he also established a Pontifical Commission on Birth Control. It released its recommendations three years later under Paul VI, finding nothing "instrinsically evil" in artificial contraception and leaving the whole matter to Catholic couples to decide. The new pope, however, rejected the recommendations of the majority and followed the advice of the minority, led by the Polish theologian who would become John Paul II. The argument of the minority report was that a liberlisation of Church doctrine here would undermine the doctrine of papal infallibility established. by the First Vatican Council. According to August Bernhard Hasler, the Catholic theologian who leaked the minority report, "the core of the problem was not the pill but the authority, continuity, and infallibility of the Church’s magisterium". This was not what Vatican II was supposed to be about. 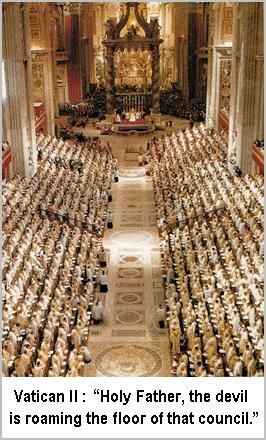 Since Paul VI there has been a series of conservative popes whose appointments are shaping the hierarchy. The Salesian priest Thomas Rosica reported in 2010 that the move away from Vatican II was reflected in the attitudes of the seminarians and younger priests, where it is creating a generational divide. Benedict XVI was no fan of Vatican II, either of the liturgical simplicity that it permitted, or of its partial accomodation to the secular state. In fact, he deplored its influence. When confronted with public outrage over clerical abuse in Ireland, the Pope first blamed it on a “weakening of faith”. However, the Irish bishops must have told him that most people saw it the other way around, so his second attempt was to blame the abuse on, of all things, a “misinterpretation” of Vatican II. The political scientist, Caroline Fourest, agrees and she notes something else. 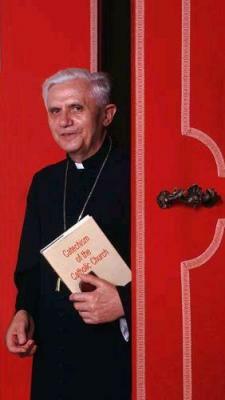 To bury Vatican II Pope Benedict XVI did not launch a frontal attack. Instead, she says, he tried to quietly undermine the separation of church and state recognised by Vatican II by substitutingwhat he called “positive secularism”. For this idea was not the brainchild of President Sarkozy of France, but came from Pope Benedict himself: a papal Trojan horse. According to Fourest, the Pope has also used the same indirect strategy to “reinterpret” Vatican II (repeatedly stressing its “continuity” with traditional Church teaching). His interpretation of Church doctrine has been anchored in the Catechism that he wrote when he was doctrinal guardian before becoming pope. In saying that Dignitatis Humanae requires “equal civil rights” for truth and error, Davies appears to be mistaking the part for the whole: equality in one respect for equality in general. He is referring to the statement in Dignitatis Humanae: §6, that where one religion has special recognition, members of other religions must also be granted religious liberty. This means they must be equally immune from coercion in practising their faith. But this immunity from coercion is the only right amongst many. As the Colombian Concordat makes clear (and even more so, as I have recently discovered, that of the Dominican Republic), Dignitatis Humanae by no means insists that “error" should have “equal civil rights” in regard to public education, marriage legislation, chaplaincy to state institutions, civil religious ceremonies, the designation of public holidays (Our Lady’s feast days, for instance), clerical immunity from civil prosecution, and other important aspects of civic life which reflect Catholicism’s uniquely-recognized status as “a fundamental element of the common good” (Colombia) [Article 1] or “the religion of the Dominican Nation” (Dominican Republic) [Article 1]. In the last declaration of the reforming Second Vatican Council, On Religious Liberty, in December 1965, the Catholic Church had decided to espouse an American model of separation of church and state, insisting that freedom was an unconditional and indivisible right. The notion that there was a Christian basis for pluralism ― the right of people to choose their own values and beliefs ― was new in Catholic belief. Conservatives in the church were uncomfortable with it from the outset. By the early to mid-1990s, John Paul began to challenge the significance of the council's intention. We are free, he argued, only in order to pursue the truth, which always has primacy. And the truth, if one followed his line of argument, was the truth of Catholicism under the protection of the pope. According to this view, pluralism was to be set over and against Catholic teaching. It was the duty of Catholics in public life, moreover, to attempt to bring civic law into conformity with Catholic moral law. In effect, John Paul was rejecting the Christian basis of pluralism and secularism inherent in the declarations of the founding fathers of America. He was condemning pluralism as license and moral relativism. He was returning to the situation that had prevailed through much of the 19th century, when Pius IX had declared freedom of conscience a form of insanity. One consequence of this backward-looking innovation was a growing distance between the founders of the new Europe and the ethical preoccupations of Catholic teaching. The European view of religion and the state, supported by most lay Catholics, is that secular government protects the rights of individuals under the law. The pope’s view, however, is that Catholics should attempt to impose morals upon on the state. The new pope is undoubtedly the best situated to allow the full and complete reconciliation between Rome and the traditionalists, at the cost of Vatican II. But will this reconciliation lead to the Church returning to the way it was before Vatican II? Not officially. No pope, especially not this one, is going to risk giving credit to the idea that there was an error of judgement on the part of the Church. Rome's obsession is to find a way to roll back the reforms of Vatican II without harming the myth of “papal infallibility”. Two discursive strategies developed in parallel by Cardinal Ratzinger and members of the Society of Saint Pius X  are being employed here. The first consists in explaining that the Traditionalist Catholic interpretation of Vatican II is not in opposition to the Council itself, but to an abusive interpretation called “the spirit of the Council”. This argument was developed by Ratzinger in 1985 in Entretien sur la foi. In veiled language he proposes a plan of “restoration” allowing the limitation of the modernist influence of the spirit of the Council, while remaining faithful to it: by rediscovering the “real Council” beyond the “spirit of the Council”. According to the political scientist Caroline Fourest [...] the sympathy between the Pope and the French president shouldn't be surprising. Their “new idea” is a Trojan horse. The term “positive secularism” was actually coined in 2005 by the then Cardinal Ratzinger, whose views have inspired two of President Sarkozy's close aides and speechwriters, the practising Catholic Emmanuelle Mignon and the Dominican friar Philippe Verdin. So what we have witnessed is Nicolas Sarkozy pretending to have an idea that originated at the Vatican, while the Pope, its delighted author, sits back and waits for the president to implement “his” idea. [...] Read the full article. ♦ “The task of authentically interpreting the word of God, spoken or written, has been given only to the living Magisterium [teaching authority] of the [Catholic] church, which it exercises in the name of Jesus Christ, that is to say, to the bishops in communion with the successors of Peter, the bishop of Rome” (85). ♦ In an apparent retreat from the spirit of the Second Vatican Council (1962-1965), the catechism states that “the Roman Pontiff, in effect, has in the Church, by virtue of his functions as Vicar of Christ and Pastor of the whole Church, full, supreme and universal power, which he can exercise with complete liberty” (882). 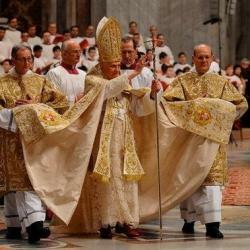 Furthermore, the bishops “have no authority separate from the Roman Pontiff” (893). ♦ For the marriage of a Catholic and a non-Catholic to be valid in the eyes of the Catholic church, church permission is required and the Catholic party is required to promise to do all possible to have the children baptized and raised as Catholics (1635). Divorce is not permitted (1644), being considered “a grave offense against the natural law” (2384). ♦ With regard to family planning, “every matrimonial act must remain open to the transmission of life” (2366), which proscribes all forms of contraception; only “periodic continence” may be used for birth control (2370). Artificial insemination and surrogate motherhood are prohibited (2376, 2377). Human personhood is considered as beginning “at the moment of conception” (2270), abortion is termed a grave wrong subject to excommunication (2272), and the state should not permit abortion (2273). ♦ Sections 2211 and 2229 say that the state must assure families of “the means and necessary institutions” for religious education, which means tax subsidies for denominational schools. ♦ Religious liberty may be subjected to “just limits” by state authorities “in conformity with the objective moral order” (2109), which somehow is not very reassuring to people of other persuasions. 12. John Cornwell, The Pope in Winter, 2004, pp. 199, 203. 14. Les nouveaux soldats du pape, (Paris, 2008), pp. 270-71. The German Superior of the Priestly Fraternity of St. Pius X, Franz Schmidberger, claims that, the talks with the Vatican, are moving “in the direction of a personal prelature”. „Allein die Tradition ist der Maßstab“, DomRadio, 25 June 2009. Philip Pullella, “Holocaust denier affair mishandled: Pope”, Reuters, 11 March 2009. 16. “Abstract: Verdict on Vatican II. The Cardinal holds that the idea of the Church is the root of the present crisis; he tackles several aspects of this crisis: relations between priests and bishops, theology, morality, women, spirituality, liturgy, ultimate goals, ecumenicism, liberation theology, evangelisation.” The English version is the 1986 Ratzinger Report. 18. New Statesman, 18 September 2008.